Garden Girl stamp set by Stampin' Up! is perfect for spring cards. Garden Girl Stamp Set by Stampin’ Up! Oh my, yes she is. And I am oh, so very ready for Spring. Instead of focusing on the Garden Girl herself, I thought I would create a couple projects with the cute little flower bed and the sweet bird. Those little things are the exact signs of Spring I am waiting for here on the East Coast of Canada. To start these cards, I began by stamping the images on water colour paper. They were then coloured using Stampin’ Write Markers and a water brush or aqua painter. Of course, I am silly enough to hand cut out the images. Did you know that Stampin’ Up! carries embossing paste in several colours as well as a variety of stencils? 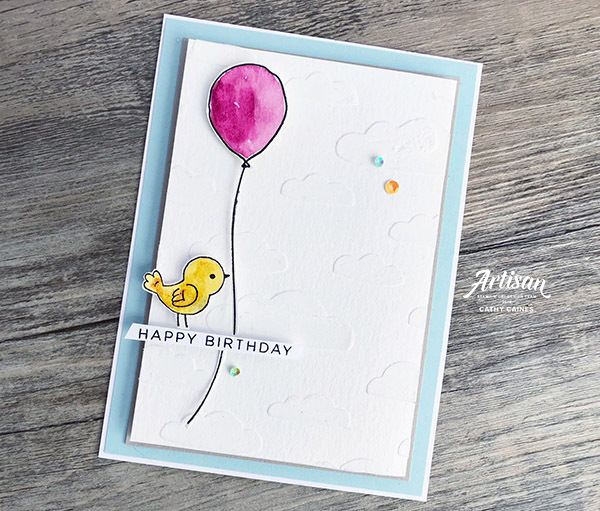 On today’s project I use the white embossing paste to add texture to the background of my cards. The Pattern Party Decorative Masks Bundle comes with four 8×8 stencils of which there’s one with a brick background and another with a cloud background. Using a palette knife or an old gift card, you simply swipe the embossing paste through the stencil onto the cardstock just like you are filling the holes with plaster in your wall. Easy. Peezy. There he is. Holding a balloon from the Balloon Celebration stamp set. How perfect does the cloud mask work with this design? If you are curious about the sentiments on these cards, they come from the stamp sets Floral Phrases and the World Best Trophy Polymer Stamp Set. Thanks for dropping by today – I hope you had an amazing holiday weekend! http://www.inthecatcave.com If you are interested in Stampin’ Up!, are living in Canada and don’t have a demonstrator, I’d love help you out. Feel free to drop me a line to get a catalogue or if you have any questions/comments you can always find me at inthecatcave@hotmail.com.